I've profiled cultural books on here before. However this one warranted its own review. 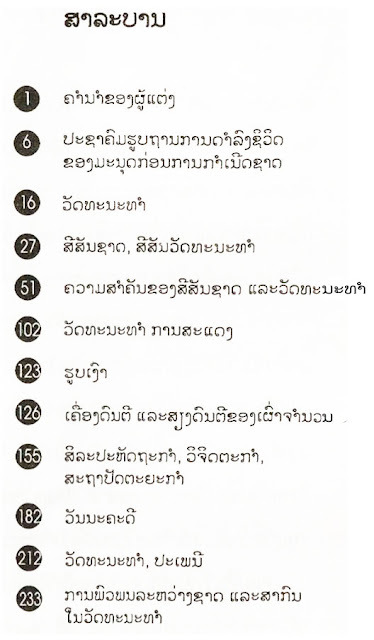 The main reason being that it differs from the others because in addition to customs and culture, it also covers the cultural performing arts, puppetry, film, music, instruments and literature among other things (full table of contents shown below). Also notable is that this one was written by a female writer (which is great to see) while many of the other cultural books I've seen are mostly written by men. Not sure why that is, but just thought I'd mention it. I came across this book quite randomly at one of those passing markets that seem to appear randomly across Vientiane at any given moment. This one was along Kaem Kong (Mekong Road) years ago. It was the last copy sitting on the bookseller’s table. I could see that they had just recently increased the price of the book. However it was still a good deal so I bought it. 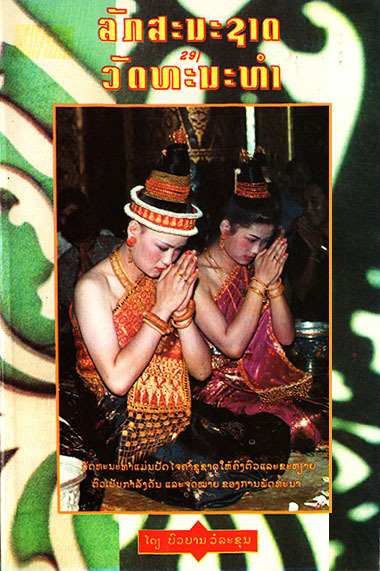 It’s not often I come across a book that explains and discusses the Lao performing arts. In fact, so far this is one of the few that I’ve seen. 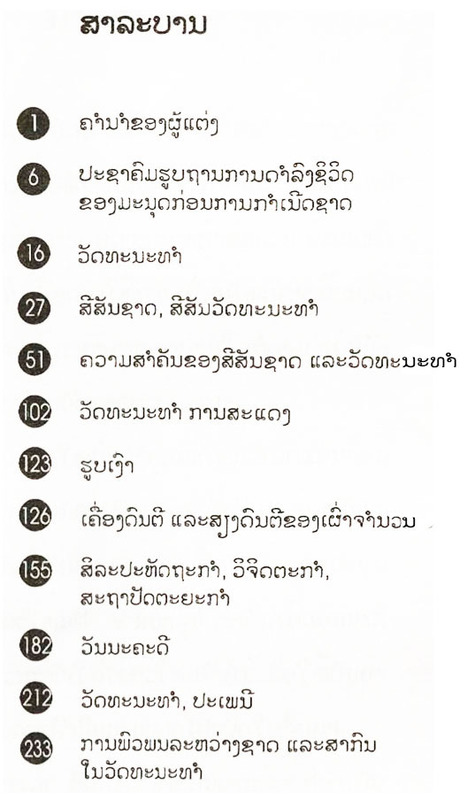 It’s written entirely in Lao with a few pictures. I was thinking there should be an English version of this book so that it could reach an even greater audience. This book contains a several sections covering different aspects of culture but most importantly for me were the variety of performing arts sections where she discusses plays and acting, puppetry performances, music. For those who might be interested, I’ve included the table of contents below. I enjoyed reading it and I found it informative. If you find a copy while in Laos, I recommend you buy it!